Summer at our house is all about two things: Fun and Food! Today I’m sharing one idea that will solve both of those problems. 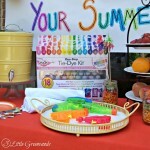 Mothers everywhere are looking for Summer Fun Activities for Kids that will keep them and their children happy. 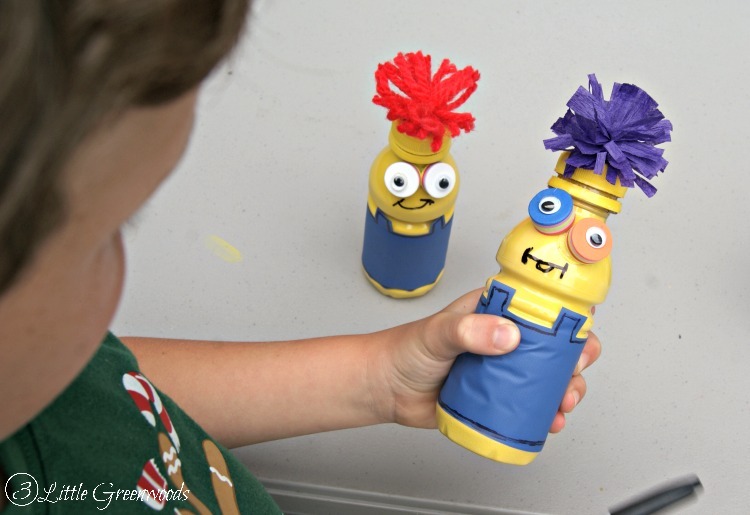 Today I’m sharing a fun Minions craft that is created from recycled Mott’s Apple Juice bottles and simple craft supplies. Minions © 2015 Universal Studios. All Rights Reserved. Before we can get started on the summer craft we have to eat a yummy snack! Thanks to our local Food Lion solving to problem of keeping my three children fed is easy. I pop in several times a week to pick up their favorite snacks for our busy summer days. 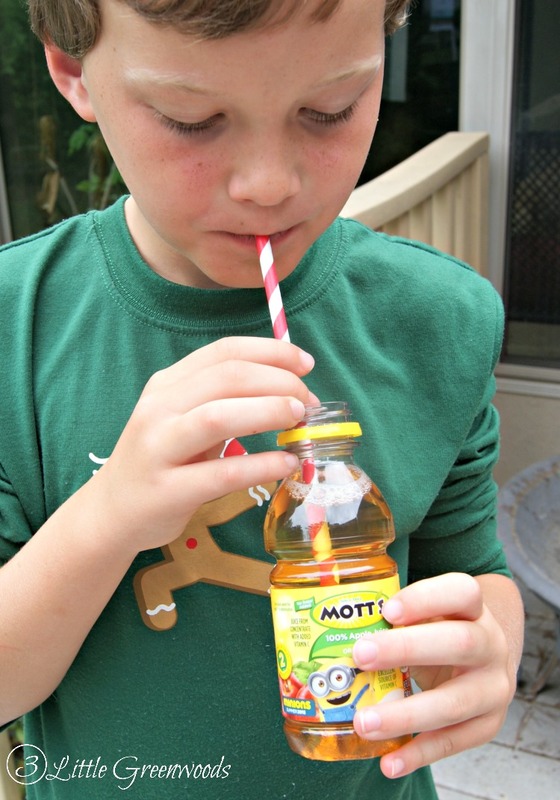 Mott’s juice drinks have a great taste that the children love and I love there are no artificial sweeteners added. 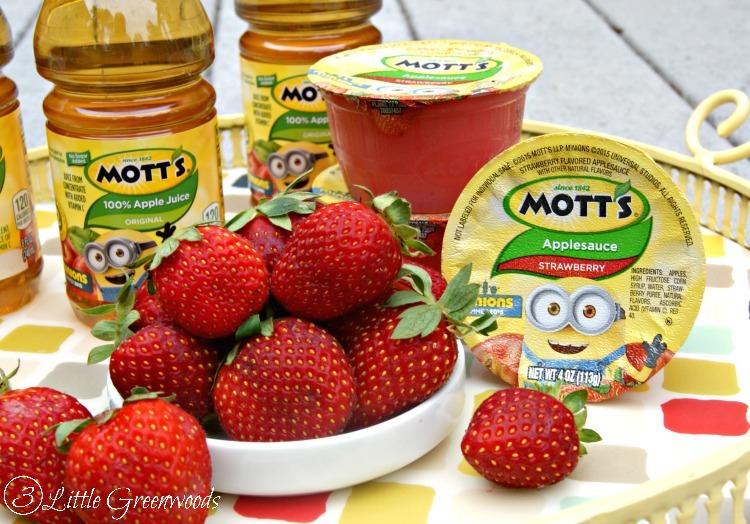 Strawberry BA-NA-NA applesauce in a 4pk of pouches that are perfect for on the go! 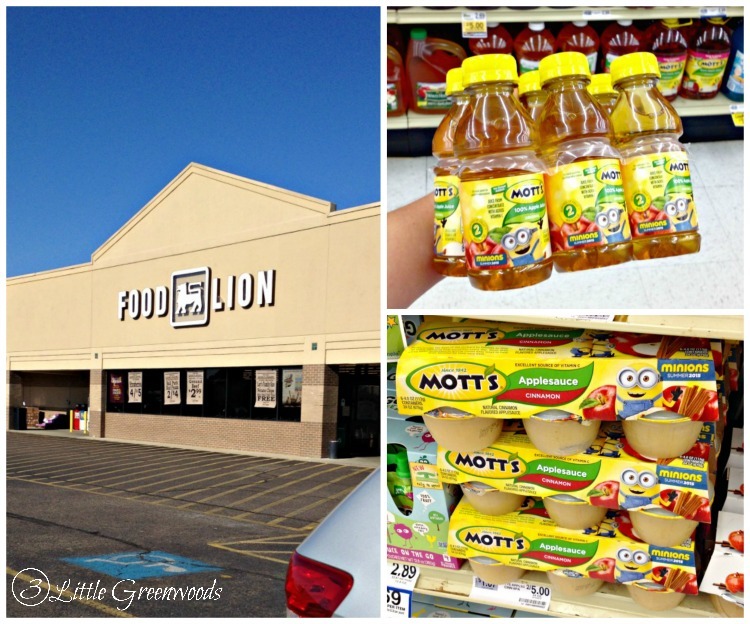 Each of these new products are gluten free and an excellent source of vitamin C.
Plus in Food Lion stores from 6/17-6/30 you can buy any (2) two Mott’s 64oz or 6-pack Juice products and get a FREE 6-pack of Mott’s Applesauce. 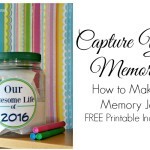 This is an awesome deal for filling up our snack bin! 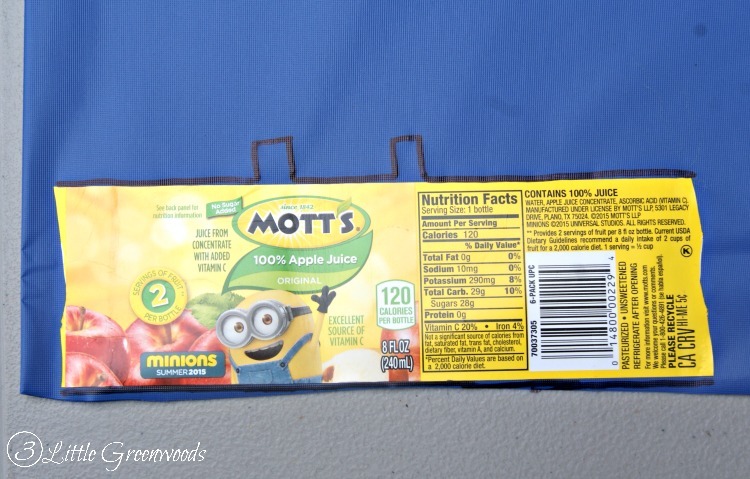 Don’t forget to look for the Limited Time Only Minion packaging on participating Mott’s products. 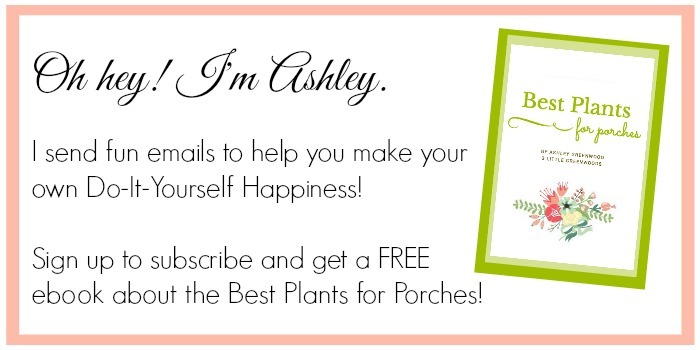 But get them quickly because they are only available through July 31st, 2015 in all Food Lion stores. Our boys have always loved Mott’s Apple Juice. Tootsie loves the strawberry flavored applesauce the best. It is an excellent source of Vitamin C plus the applesauce is gluten free. 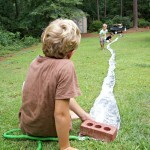 Now that snack is over it’s time for easy summer fun activities for the kiddos. I have to be honest and tell you that all of these things were gathered from my craft room supplies. There’s few things I dread more than taking my crew to the craft store for materials so I always search for items to use that I already have on hand. 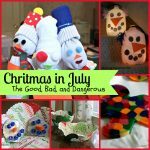 Make sure to check out your craft stash before you head to the store. You never know what you may find! Begin by removing the labels from the juice bottles and allowing them to dry. We placed the bottles upside down on a cooling rack. 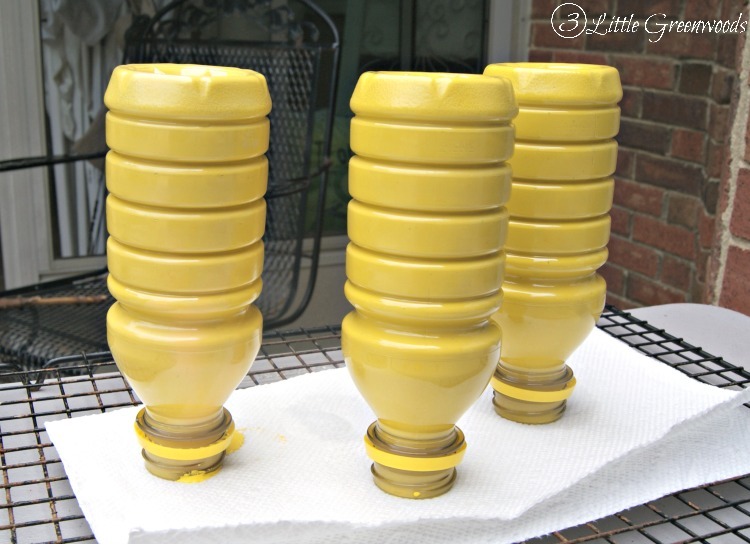 Once the insides of the bottles were dry, the children squeezed a teaspoon amount of yellow craft paint into the bottles. Give the bottles a quick shake to spread the paint to cover the inside of the bottle. 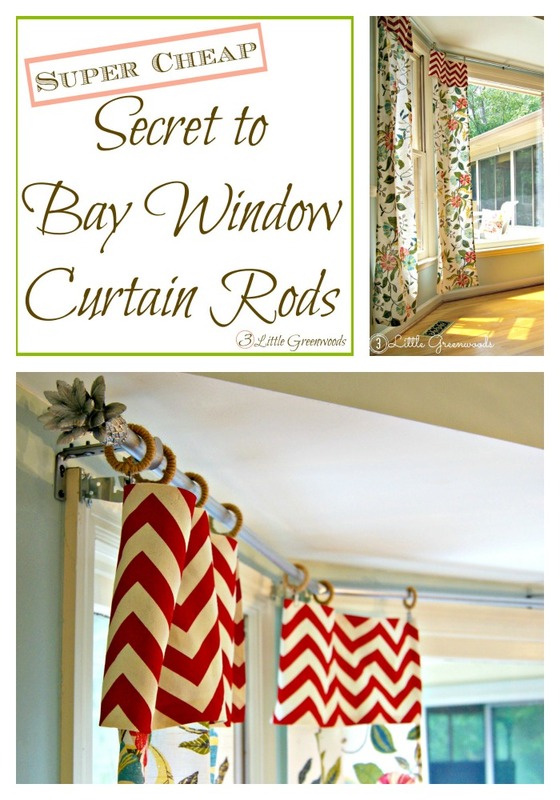 Turn each upside down on paper towels and allow the bottles to dry for an hour or two. 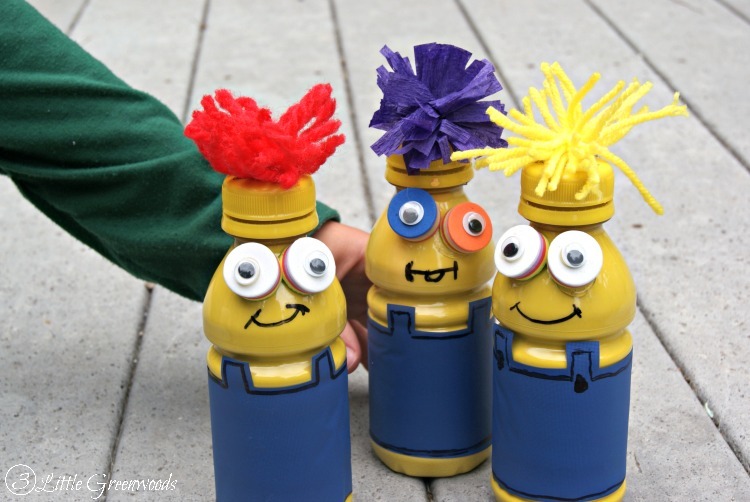 While the bottles were drying we got busy creating pompoms for our Minions’ heads. Yarn pompoms are super easy to make following this tutorial. 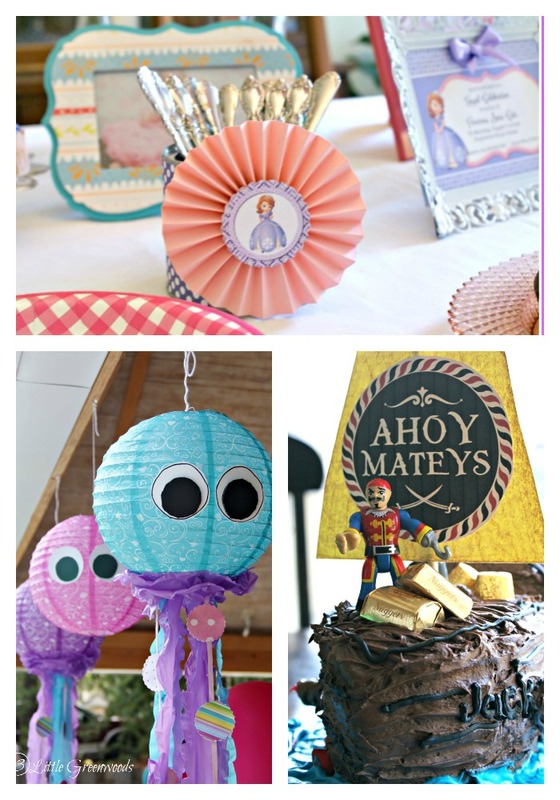 Crepe paper streamers make fun frilly pompoms. 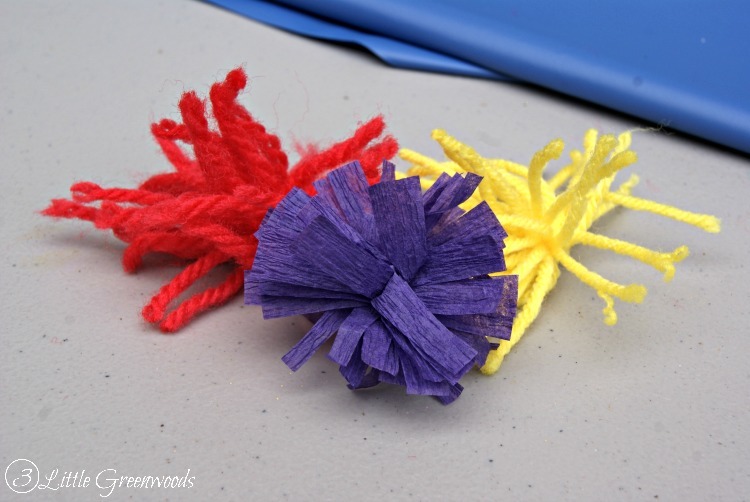 Click here to learn how to make pompoms with streamers. 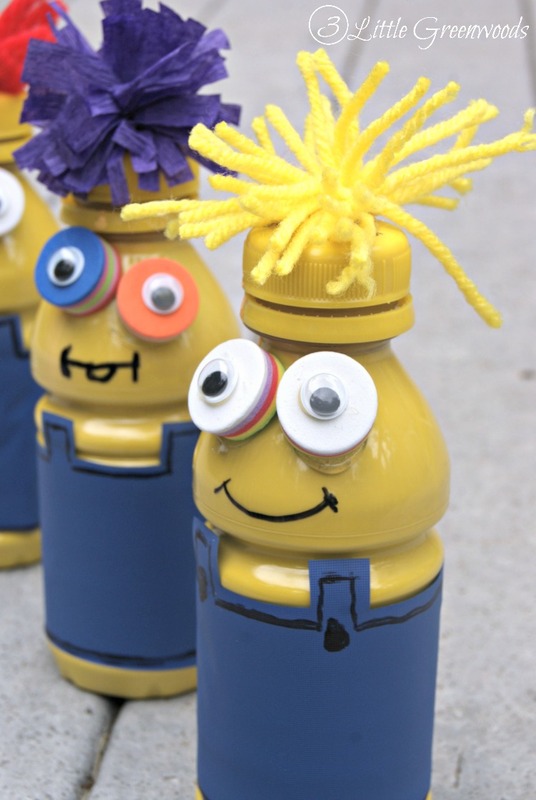 One of the juice bottle labels was used as a template to make the Minions’ cute little blue overalls. 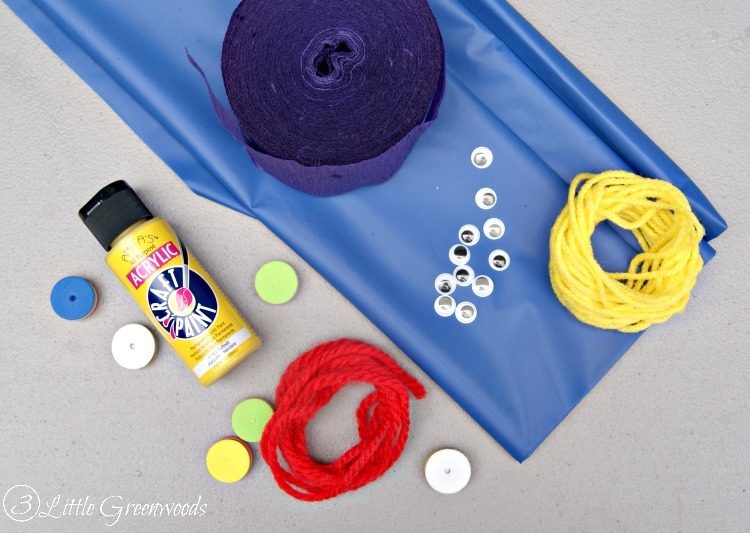 Blue fabric or felt would have been a great choice for this craft but there was none to be found in my supplies. This heavy plastic tablecloth leftover from our last party was all I could find. Thank goodness it worked perfectly. The children used white glue to attach the wiggly eyes to the foam circles. 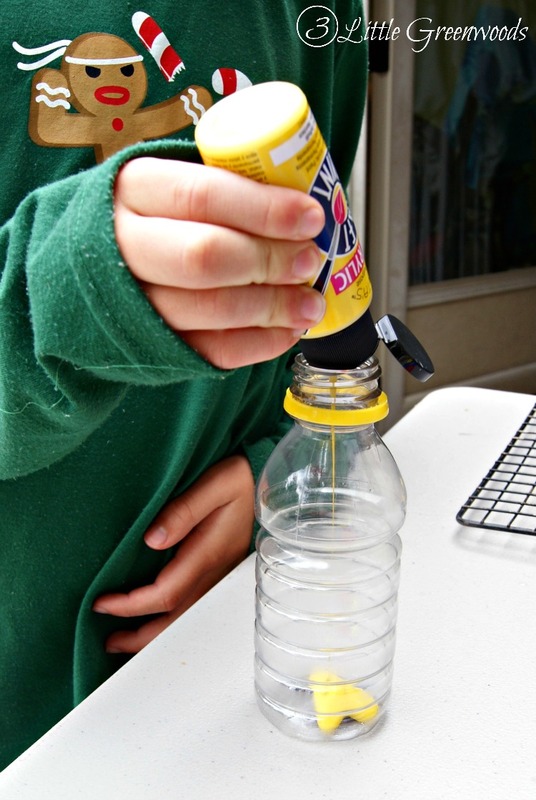 Then the foam circles were hot glued onto the bottle. I also used hot glue to attach the overalls and pompom hair. A black marker was used for the silly smiles. Our youngest son made sure the crazy one had his tongue stuck out! My sweet boy could hardly wait until all the pictures were snapped before he began to play with our fun little guys! 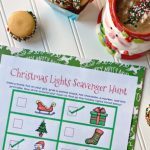 Enjoying summer with the kiddos can be so much fun! 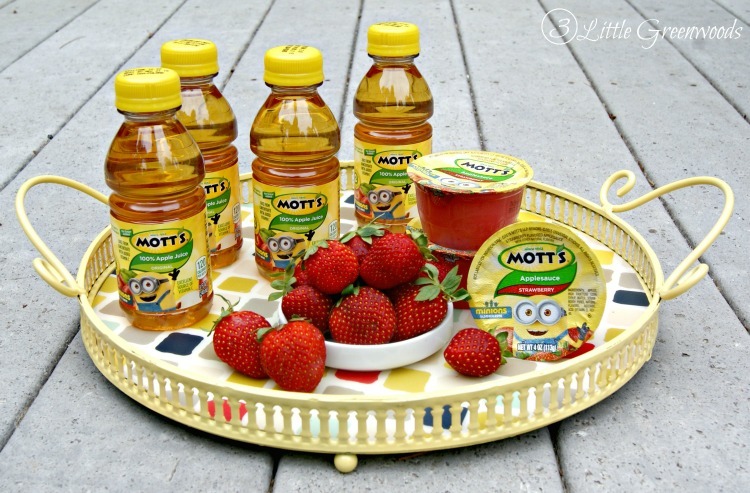 Just make sure to keep them fed with yummy Mott’s products and busy with lots of summer fun activities for kids. 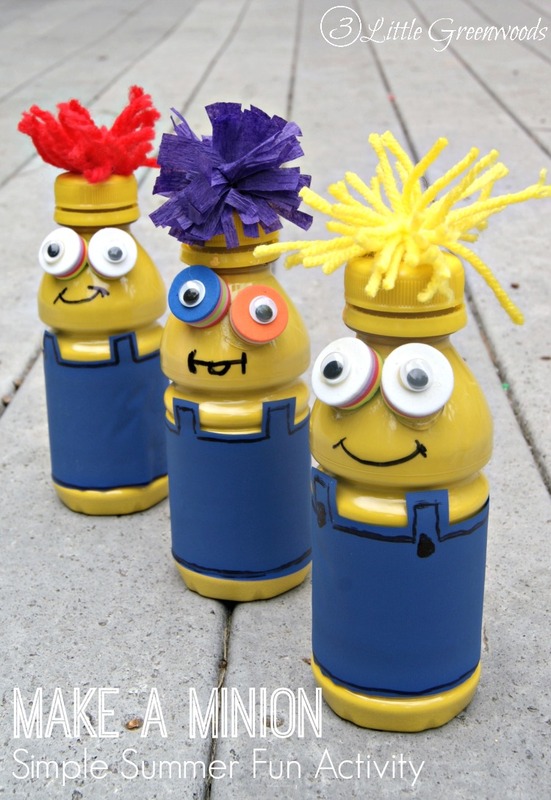 So grab a few empty juice bottles and search your craft supplies to Make A Minion Craft today! Are you ready for this summer’s Minions invasion? Which Mott’s products do you want to stock up on for more fun like this at Food Lion this June? 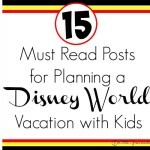 15 Must Read Posts for Planning a Disney World Vacation with Kids!